The scallop shell is the traditional symbol for the Sacrament of Baptism, reflecting how it is that God’s grace and love are poured out upon our lives. 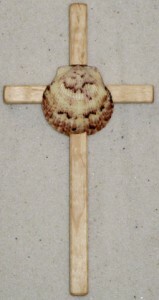 It is a symbol used to mark the way on pilgrimages. It says that on the pilgrimage of life, God’s blessing is poured out upon life. 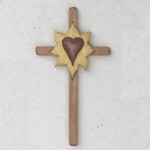 This cross can have either a natural scallop shell or a hand-carved wooden shell. Both are set into the wooden cross. Options: There are two options for the scallop shell. On a trip to Sanibel Island, Florida, I collected many beautiful scallop shells. 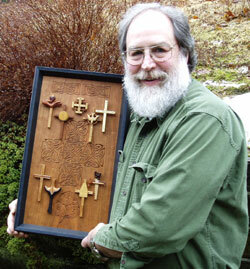 One of these can be set into the center of the cross. The second option is a hand-carved wooden scallop shell made from Olive wood, curly maple, or Padauk (orange hue which darkens with age). 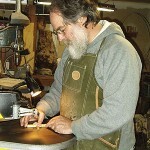 To personalize: Provide me a piece of wood that has particular meaning to you. 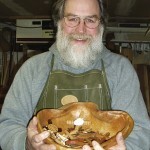 I have used a tree branch from a family’s home, the arm of a chair from a broken rocking chair, or a leftover piece of lumber from a baby’s cradle. I need enough good wood (straight and free of blemishes, knots, or cracks) to mill a piece that is one-inch square and 9 inches in length. Hardwood makes for the best results. The celebration of this Sacrament is a sacred time. 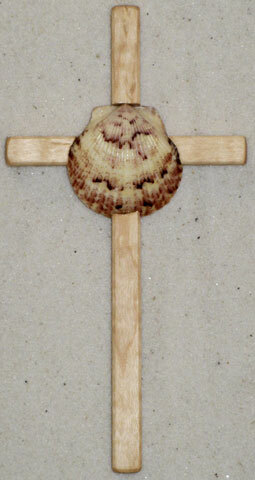 It can be honored with a personalized Baptism Cross using the traditional symbol of the scallop shell and cross.